DINING HALL: The East and West Camp Dining Halls do much to set the atmosphere of the camping experience. Thanks to the crafts and décor covering every wall, these two buildings create an atmosphere which reminds us of the scouts that came to Ma-Ka-Ja-Wan over 80 years before us. Dining is never a time to use our inside voices. Songs and skits are a part of every meal. Three well-balanced meals are served each day in the dining hall. 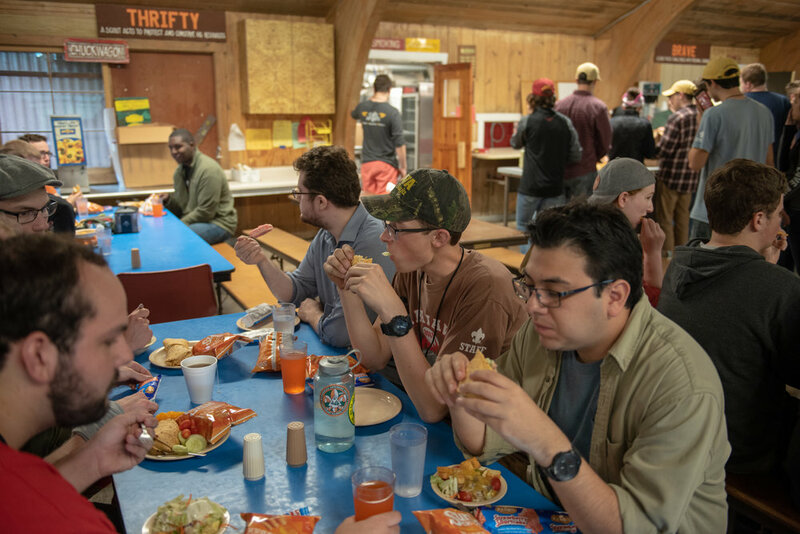 The Dining Halls do much to set the atmosphere of the camping experience, and can remind us of the scouts that came to camp over 80 years before us. Dining is never a time to use our inside voices, so songs and skits are a part of every meal. Tables are reserved for each Unit when possible. Units must provide 2 waiters for every 10 (each meal). Waiters report to the dining hall 15 minutes prior to the meal. Leaders are encouraged to establish a rotating schedule to share the responsibilities during their stay, and should inform the Staff in advance of any meal count changes. SUNDAY DINNER is the first opportunity to get everyone together, so patrol cooking is not an option. WEST CAMP – Tuesday Night Cookout – The West Camp Staff gets Tuesday night off, so Troop Leaders host a “Cookout” at the West Camp Dining Hall. Patrol Cooking is not an option in West Camp for this meal. BOTH CAMPS – Wednesday Night is the Scoutmaster Cookout. Patrol Cooking is not an option in either camp. EAST CAMP – Thursday Night Cookout – The East Camp Staff gets Thursday night off, so Troop Leaders host a “Cookout” at the East Camp Dining Hall. Patrol Cooking is not an option in East Camp for this meal. SATURDAY BREAKFAST is our last meal together, when final reminders and announcements are made. Patrol Cooking is not an option in either camp. If your Troop is in camp, we will expect you in the dining hall, so please let the camp staff know (early in the week) if your unit plans to leave before then. Thank you in advance for your consideration. NOTES: No discounts given if you provide any of your own food for any meals. Notify Kandle Dining in advance of day trips (rafting, etc.) so they can plan your meals accordingly. NOTE: All menus below have been approved (and signed) by the Kandle Dining Dietitian. Our camp community is served three well-balanced meals each day. If your son has a food allergy, we will work to offer substitutions but we do not make modifications for food preferences, as we offer a variety of food options. While at camp, your child could be served one of the many dining styles. He or she may participate in family style dining, cafeteria style dining, or self-serve bars. It is the camp’s expectation that by sending your child to camp, he or she has the necessary knowledge of their diet and can manage their food choices. Camp cannot guarantee an allergen free environment. Careful consideration needs to be taken for campers with severe allergies, particularly those susceptible to airborne transmission. If your child has a severe allergy or dietary restriction, contact the camp directors to discuss if camp is properly equipped to manage your child’s needs. We are conscious of the ingredients in all our meals as it pertains to allergens. Substitutions for the main course and dessert are offered. In addition to the meal served, our salad bar/breakfast bar contains a variety of rotating items, including garbanzo beans, edamame, croutons, and cheese. We also make peanut butter available for all to choose and offer Almond Milk or Soy Milk as a substitution for a milk allergy. For meals eaten out of the dining hall on trips and pack outs, we identify the food that contains allergens. Substitutions are given to those with dietary restrictions. Allergies and special diets are a common concern of our campers. Our food service providers are very experienced with accommodating most diets, including food allergies, religious restrictions, and other health-related diets. We are happy to accommodate any diet with religious, medical or allergy needs. While we work to meet all dietary requirements, food is prepared in an area with milk, eggs, peanut, tree nut, wheat, soy and fish and cross-contamination can occur. IMPORTANT: The 2019 MSR Special Diet Request Form is the only one that will be accepted while participating in our Boy Scout Summer Camp programs this summer. Since it contains personal and confidential information, Jara Bauer is the only one who should receive this completed form. Contact her directly with all of your dietary questions. She must receive this form at least three (3) weeks prior to arrival. If you are a unit leader, direct all families in your unit to this page. Thank you.